The number one retail store fixtures available in the US today for all types of retail stores is the Double Sided Island fixture and Single Sided Wall fixture designed with the ultimate in merchandising and cosmetics in mind. 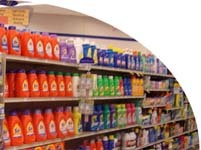 Back room storage shelving for light duty storage needs available in most heights and depths. Wooden Slatwall Island Displays available in an H Display, Square, Cubic Tower, and Four Way. 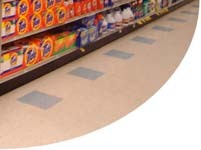 Gondola Countertops are great for Convenience a Store, Gas Station, or Liquor Store cash register counter that will also display small products such as Candy, Beef Jerky, Potato Chips, and also Counter Spinners on the top of the countertop that is a good retail store fixture. 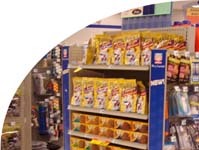 Many chip displays and countertop candy racks for all types of stores including retail stores. CD DVD Displays are the lightweight alternative for merchandising DVD's, Music, and Software CDs. 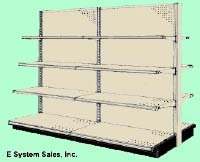 The wire frame construction is designed for use on runs with 22" Base Shelves. 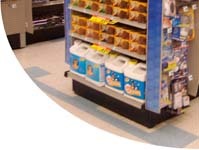 Spinner displays are effective as small retail store fixture in environments that do not have a lot of room.